This time of year is Cherry Blossom time for sure! One of the many places on my 'to go' list is Japan, during the Cherry Blossom Festival. How fun it would be! In honor of this marvelous time of year, I created a special ornament for my shop! I love this color palette, and plucked it straight from the pictures I've seen of the Cherry Blossom Festivals in Japan. Shades of pink mixed with chocolate brown and a bit of white. I may have a few other color combinations soon. It just depends on whether or not I have some more extra time before summer. 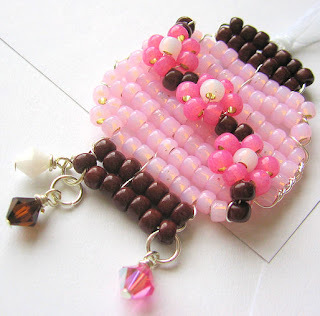 I've also thought this would make a beautiful pendant using smaller beads. So many ideas! So little time! What a busy week this was! Family pictures, STARS assessment at work, working on new items, working on orders, getting The Sweetie's car fixed... Whew! I'm sooo glad for the weekend! I've also listed a couple new items in my shop. This necklace was inspired by the yummy trend of selling little 'shots' of frosting at bakeries and cupcakeries. 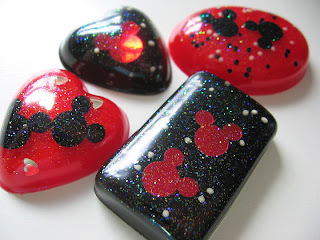 Being a total frosting fiend myself, I set out to find a way to do this in everlasting jewelry form! Soon I'll be adding Frosting Shot rings, and pins! I don't have very many of these left, so if you really want some, get them soon! The Sweetie and I also did a collaboration of sorts this week. He's a huge fan of the Video Games Live show. (If you haven't seen it, you really should!) And wanted me to make a little beaded something to see what I could come up with. He helped me pick out colors, necklace cord, etc. It was quite a fun effort! The Sweetie also 'helped' with the photo. ^_^ It was a very fun project to work on together. Hopefully we will do more of this in the future! For now... I have the munchies! Time for a snack! What wonderful luck I have! 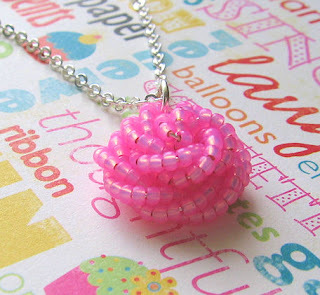 I have been featured in another wonderful treasury! 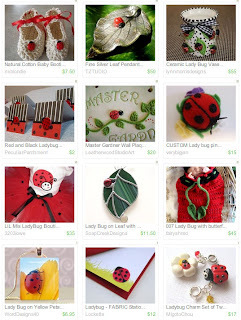 This time showcasing some very lovely ladybugs! That's my polymer clay charm set down there on the bottom right. :) How fun! I've also started a new promotion in my shop! 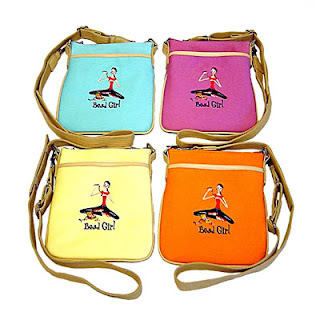 With each purchase of $10 (before shipping!) 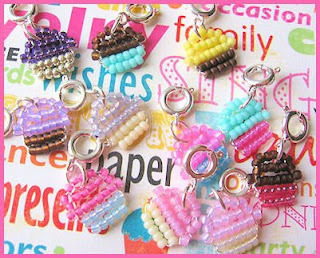 you will get a free beaded cupcake charm! So, if you spend $10, you get one free charm; spend $20, you get 2 free charms; spend $30, you get 3 free charms, etc.! And there's no limit on the free charms! That's all from me for now. I have some new items that I want to work on, so I best get busy with that! Hope everyone is having a great weekend, and a Happy Easter! 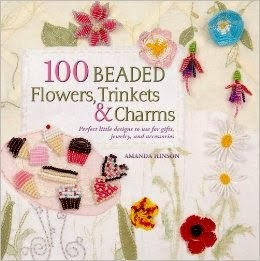 I've just been featured in another beautiful treasury! 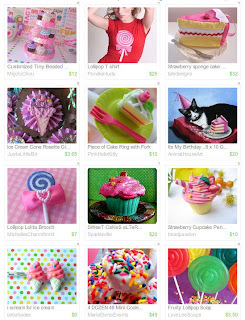 I love all the bright colors and candy and frosting... Yum! In other fun news, I'm also working on a really fun custom order right now! 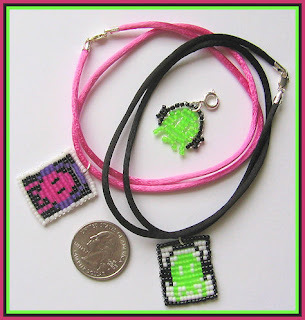 Six beaded lime margaritas - key chain size! I had to order some more 'margarita' colored beads tonight though, so that I can finish them up this week. And, I may have thrown a few extra things into my shopping cart before I checked out... Oops! Brr! It's pretty cold here right now. I think I'm going to curl up in my nice warm bed and watch a movie! I hope you guys are staying warm, too! Well, I had quite the productive weekend as far as beading goes! 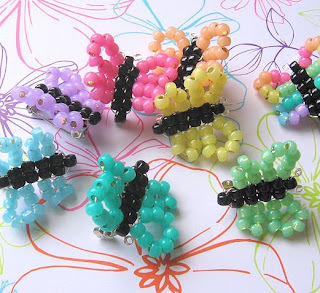 First, I finished all these cute little beaded butterfly pins, and added them to my shop. When The Sweetie and I were at the store a few nights ago, I bought some Cotton Candy snow cone syrup to use with our ice shaver. Then we get home and I remember that I had thrown out all our old ice cube trays at the end of last summer!!! So I still haven't had my Cotton Candy shaved ice!!! Grr! That little incident prompted me to finish working out the pattern for these little beaded snow (or is it sno???) 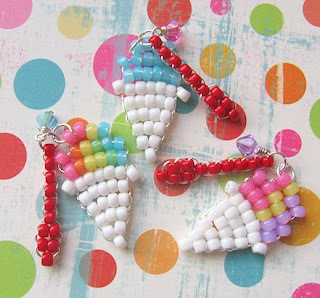 cone charms. I made up a few to add to my shop tomorrow! When you order them, you can pick any flavors you want! And, you can choose one, two, or three flavors for each snow cone! Speaking of snow... I was just looking at the forecast for tomorrow... And I noticed they're calling for snow tomorrow night!!! How crazy! I'm done with cold weather! I'm ready for some nice warm keep-the-windows-open-all-day weather! It's too late to add these to my shop! But if you would like a necklace made out of one of these little Peepers, just let me know! Necklaces are $10 each plus shipping. I only have these four available! 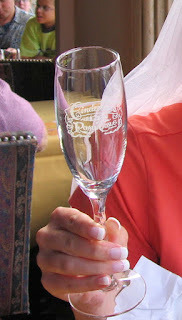 While on our Disneymoon in 2005, The Sweetie and I were lucky enough to have an early dinner one day at Cinderella's Royal Table. What an experience! We were the first people seated for dinner. Since we were the first ones seated (and since it was our Disneymoon!) we got this wonderful window seat! See the Mickey Mouse confetti sprinkled all over the table??? I used some of that when we got home to make these magnets! Dinner was delicious! And our waiter called us 'Your Highness' and 'Your Majesty' the whole time! So fun! 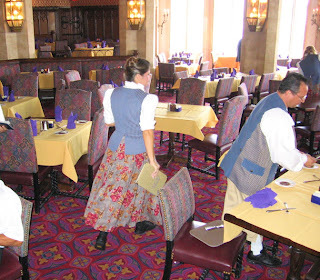 About half way through dinner, we decided that we wanted to order a smoothie so that we could have one of the Cinderella's Royal Table collector mugs to take home. Our waiter asked if we wanted the smoothie just for the mug, and laughed as we told him, "Yes!" "I have something even better than that! ", he says as he rushes away. He comes back with a white box. I have no idea what could be inside! I open it to find this! 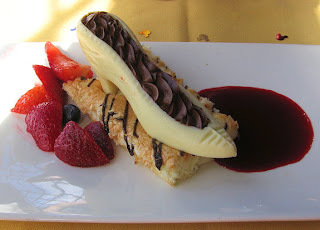 Cinderella's White Chocolate Slipper - A delicious white chocolate slipper filled with chocolate mousse, resting on a pillow of angel food cake drizzled with dark chocolate. Served with raspberry coulis, and fresh seasonal berries. Oh. My. Gosh. I can't even tell you how hard it was to eat this! I momentarily thought of trying to get it home in one piece. Then decided that it was chocolate, and chocolate is delicious, and I better eat this chocolate shoe! 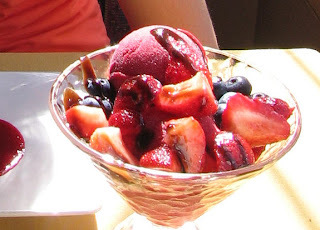 Raspberry Sorbet served with season berries and drizzled with dark chocolate. It really was just as delicious as the slipper! I could eat either of them every day! We were at the middle window; the one that sticks out the most there in front. We loved that window seat! 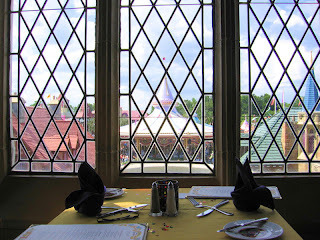 It has a gorgeous view of Fantasyland, with the carousel in the center. This was, by far, one of the most magical, unique places I have ever eaten. I highly recommend it for special occasions, especially the romantic ones. 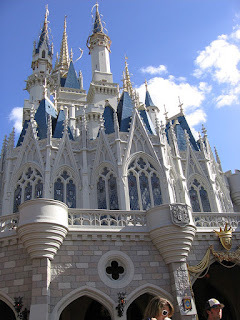 ;) Of course, any time you want to eat there will be magical! 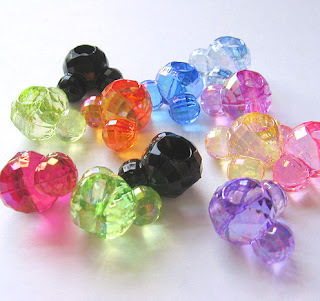 So after giving it quite some serious thought, I've decided to postpone adding the scented beads to my shop until this summer. I'm thinking that during the summer I will have waaay more time to work on batches of these, and get them mailed out quicker. But, of course, if you need some before this summer, please don't hesitate to ask! I'm always glad to set up a special listing for you! It's just that they aren't going to be officially added 'til I'm off for the summer!